Reading and share top 46 famous quotes and sayings about Pressured by famous authors and people. 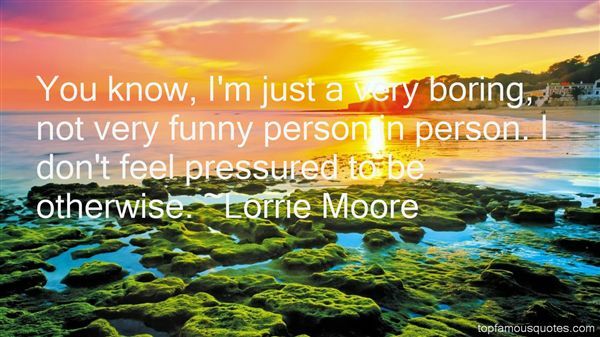 Browse top 46 famous quotes and sayings about Pressured by most favorite authors. 1. "I mean, I look at my dad. 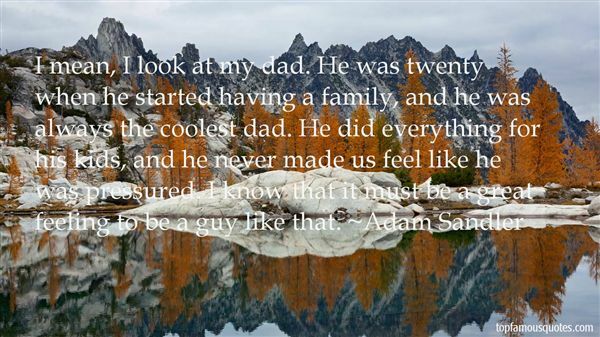 He was twenty when he started having a family, and he was always the coolest dad. He did everything for his kids, and he never made us feel like he was pressured. I know that it must be a great feeling to be a guy like that." 2. "Rather than a tale of greed, the history of luxury could more accurately be read as a record of emotional trauma. It is the legacy of those who have felt pressured by the disdain of others to add an extraordinary amount to their bare selves in order to signal that they too may lay a claim to love." 3. "Here my advice to young gay person or actor its to be yourself and not to be pressured into what other people want you to be"
4. "Previously the same Polish audiences would have been pressured into seeing cinema made for adults, films made by us about those spheres of life that were significant for us and which should be significant for our society." 5. "I felt pressured by continuous touring." 6. "Netanyahu is pressured easily, gets into a panic, and loses his senses... to run a country like Israel a leader needs to have reason and judgment and nerves of steel, two traits he does not have." 7. "And write what you love - don't feel pressured to write serious prose if what you like is to be funny." 8. "I was never directly pressured by peers, but by surrounding myself with others who were experimenting with smoking provided a certain false comfort." 9. "Though her soul requires seeing, the culture around her requires sightlessness. Though her soul wishes to speak its truth, she is pressured to be silent." 10. "Sometimes a people lose their right to remain silent when pressured to remain silent." 11. "And never - not in a single case - was the explanation, 'I was pressured to do this.' The explanation was very often, 'The limited data we had led one to reasonably conclude this. I now see that there's another explanation for it.'" 12. "And let me take one of the explanations most commonly given: Analysts were pressured to reach conclusions that would fit the political agenda of one or another administration. I deeply think that is a wrong explanation." 13. "Still, language is resilient, and poetry when it is pressured simply goes underground." 14. "Knowing that Draco's hopeful face had probably been drilled into him by months of practice did not make it any less effective, Harry observed. Actually it did make it less effective, but unfortunately not ineffective. The same could be said of Draco's clever use of reciprocation pressure for an unsolicited gift, a technique which Harry had read about in his social psychology books (one experiment had shown that an unconditional gift of $5 was twice as effective as a conditional offer of $50 in getting people to fill out surveys). Draco had made an unsolicited gift of a confidence, and now invited Harry to offer a confidence in return... and the thing was, Harry did feel pressured. Refusal, Harry was certain, would be met with a look of sad disappointment, and maybe a small amount of contempt indicating that Harry had lost points." 15. "My parents never pressured me except to advise me against acting." 16. "I know a lot of parents of kid actors I've worked with have pressured them into acting, but my parents are different. I'm really lucky to have them because they let me make my own decisions." 17. "If you feel flustered when pressured to make a hard decision in a rush, the best answer is usually no." 18. "For Devil's Backbone I loved it but I felt very pressured but so I was neurotic on the shoot." 19. "We're all teased or pressured into conforming to the all-levelling social norms of mediocrity." 20. "More and more movies have been pressured to allow reporters and TV cameras to come onto the set while you're working, and I find that a real violation." 21. "We know from our recent history that English did not come to replace U.S. Indian languages merely because English sounded musical to Indians' ears. Instead, the replacement entailed English-speaking immigrants' killing most Indians by war, murder, and introduced diseases, and the surviving Indians' being pressured into adopting English, the new majority language." 23. "Dad, youre so far off the mark I can't even...Lincoln hasn't pressured me at all!" I grabbed my bag and heaved it onto my back. "WE'RE JUST FRIENDS! He's not even interested in me like that - and thanks to you," I shook my head at him in utter disbelief, "he never will now." 24. "Many people feel so pressured by the expectations of others that it causes them to be frustrated, miserable and confused about what they should do. But there is a way to live a simple, joy-filled, peaceful life, and the key is learning how to be led by the Holy Spirit, not the traditions or expectations of man." 25. "Safe gender is being who and what we want to be when we want to be that, with no threat of censure or violence.Safe gender is going as far in any direction as we wish, With no threat to our health, or anyone else's.Safe gender is not being pressured into passing, not Having to lie, not having to hide.Sane gender is asking questions about gender - talkingTo people who do gender, and opening up about ourGender histories and our gender desires.Sane gender is probably very, very funny.Consensual gender is respecting each others' definitionOf gender, and respecting the wishes of some to be alone,And respecting the intentions of others to be inclusive inTheir own time.Consensual gender is non-violent in that it doesn't forceIts way in on anyone.Consensual gender opens its arms and welcomes all People as gender outcasts - whoever is willing to admit it." 26. "An introvert may feel asocial when pressured to go to a party that doesn't interest her. But for her, the event does not promise meaningful interaction. In fact, she knows that the party will leave her feeling more alone and alienated. Her social preference may be to stay home and reflect on a conversation with a friend, call that friend, and come to an understanding that is meaningful to her. Or she might indulge in the words of a favorite author, feeling a deep connection with a person she has never met. From the perspective of a partygoer, this introvert may appear to be asocial, when, in fact, the introvert is interacting in a much different way." 27. "You know, I'm just a very boring, not very funny person in person. I don't feel pressured to be otherwise." 28. "I never allow myself to be pressured." 29. "They are boiling with the pressured energy of explosive forces confined in a small space, and with the fervor of all religious movements in their early, purist stages. It is not enough to give lip service and to believe in equal pay: there has to be a conversion, from the heart. Or so they imply." 30. "I don't think anyone will believe me, but I've never been pressured by a publisher to churn out a book." 31. "Fleetwood Mac has been pretty truthful. Open about what we do. We've always done it from the inside out. Versus being pressured from the outside and changing the inside. And that's our story." 32. "I had piano lessons at five and started guitar at ten, but although music and acting was always around me, my parents never pressured me into it." 33. "The line between good and evil is permeable and almost anyone can be induced to cross it when pressured by situational forces." 34. "I don't think young men or women should feel pressured into marriage. You shouldn't marry anyone, in my opinion, who you have to try hard for." 35. "<> Me, too...Huh, maybe I do like Tom Cruise. But I hate feeling pressured to find him attractive. I don't." 36. "Jennifer to Beth: Ech. I don't like Tom Cruise. Beth to Jennifer: Me neither. But I usually like Tom Cruise movies. Jennifer to Beth: Me too... Huh, maybe I do like Tom Cruise. But I hate feeling pressured to find him attractive. I don't.Beth to Jennifer: Nobody does. It's a lie perpetuated by the American media. Tom Cruise and Julia Roberts.Jennifer to Beth: Men don't like Julia Roberts?Beth to Jennifer: Nope. Her teeth scare them.Jennifer to Beth: Good to know." 37. "All governments should be pressured to correct their abuses of human rights." 38. "The more you pray, the less you'll panic. The more you worship, the less you worry. You'll feel more patient and less pressured." 39. "I see explicit covers on magazines, and they're getting even more explicit, and it's like, Are women being empowered, or is this just what sells magazines? Are they feeling pressured, or have they really come into themselves and are saying, 'I am woman, hear me roar?'" 40. 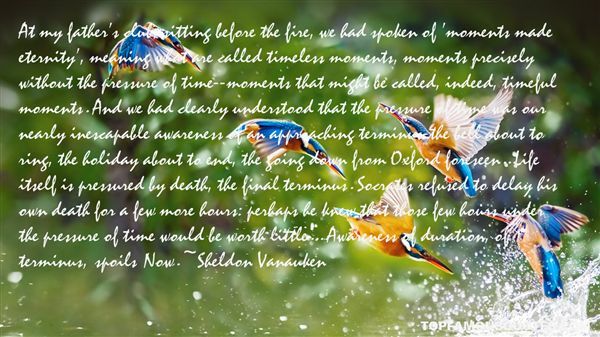 "At my father's club, sitting before the fire, we had spoken of 'moments made eternity', meaning what are called timeless moments, moments precisely without the pressure of time--moments that might be called, indeed, timeful moments. And we had clearly understood that the pressure of time was our nearly inescapable awareness of an approaching terminus-the bell about to ring, the holiday about to end, the going down from Oxford foreseen...Life itself is pressured by death, the final terminus. Socrates refused to delay his own death for a few more hours: perhaps he knew that those few hours under the pressure of time would be worth little....Awareness of duration, of terminus, spoils Now." 41. "God rewards the soul that focuses on Him with attention and love, and God rewards that soul by exercising a rigorous compulsion on it, mathematically proportional to this attention and love. We must abandon ourselves to this pressure, and run to the precise point where it leads, and not a single step further, not even in the direction of what is good. At the same time, we must continue to focus on God, with ever more love and attention, and in this way obtain an even greater compulsion — to become an object of a compulsion that possesses for itself a perpetually growing portion of the soul. Once God's compulsion possesses the whole soul, one has reached the state of perfection. But no matter what degree we reach, we must not accomplish anything beyond what we are irresistibly pressured (compelled) to do, not even in the way of good." 42. "Your job is obviously very pressured. ""I thrive under pressure," I explain. Which is true. I've known that about myself ever since...Well. Ever since my mother told me when I was about 8." 43. "You are here with a unique purpose. Stop letting others define you. Stop letting others dilute you. Don't be bullied or pressured into being less than you are." 44. "At any given point you can release your greatest self. Don't let anyone hold you back. Don't let anyone dilute you. Don't be peer pressured into being less than you are. People willing to dilute themselves for the sake of others is one of the great tragedies of our time. Stop letting others define and set the pace for your life. Get out there and be your best. Do your best. Live your best. Make every day count and you'll see how exponentially more exciting, thrilling, successful, happy and full your life will be." 45. "As coal pressured into pearls by our weighty existence. Beauty that arose out of pain." 46. "The night we met-I'm not like that guy." His jaw was rigid. "I know tha-" He placed a finger over my lips, his expression softening. "So I don't want you to feel pressured. Or overpowered. But I do, absolutely, want to kiss you right now. Badly." My parents meant well, but the road to Hell is paved with publicity stunts."